Mongodb is very popular open source, document based NoSQL database. In a previous NodeJS mongodb tutorial we explored how to perform CRUD operations on mongdb database using nodejs. 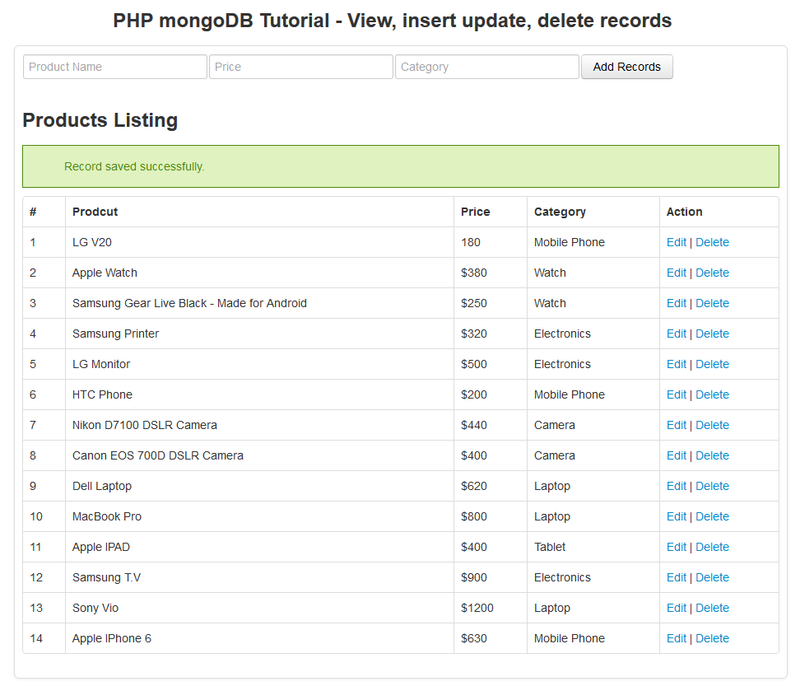 In this php mongodb tutorial you will learn how to fetch, insert, edit, delete records in a mongodb collection using php. To create a database in mongodb, “use database_name” command is used, if database does not already exist, a new database is created. To view all databases in mongodb, type > show dbs. db.createCollection(collectionName) is used to create a collection. In order to insert records to mongodb collection insert method is used. To insert bulk records, all records are added in an array. find() method fetches records from mongodb collection. To work with mongodb in php you have to install php mongodb extension. Visit php mongodb packages site and download mongodb driver package compatible with your php version and OS. For example for windows you can visit this link. Unzip and paste php_mongo.dll file inside your WAMP or XAMPP php installation extension folder. Suppose you have installed XAMPP, Then go to php folder and open ext folder like C:\xampp\php\ext. Open php.ini file and enable php_mongodb extension. After installation of mongodb driver, restart Apache web server. In root folder if you create a php file and call phpinfo() function you can see mongodb extension is loaded. To connect to a mongodb database mongodb driver manager is used. All database connections are maintained by mongodb driver manager. Database connection is not created on instantiation of a mongodb driver manager object. Driver manager takes parameter server address localhost with a port 27017. A messages array is created to save success or error messages to be used later. Create a file index.php. 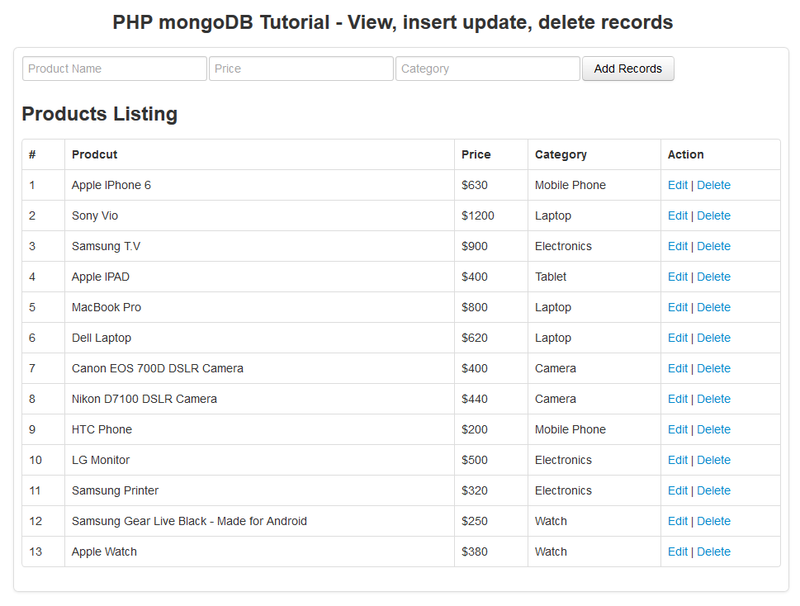 This page displays records from a mongodb collection. 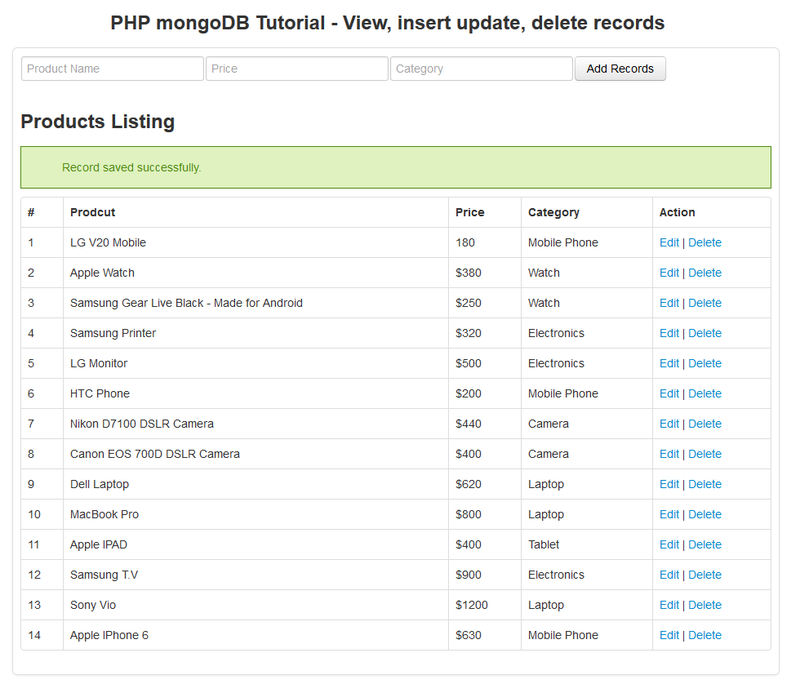 config.php is included into index.php to use mongoDB driver manager object. When ever a new record is inserted, updated or deleted, user is redirected back to index page with a flag as query string parameter. Based on flag parameter a message from messages array in config is displayed to user. Next $filter variable is created. Filter can contain any condition to be met to select a records. For example it can be set to select the documents where price is greater than $50. If you are familiar with relational databases then you can consider it as a where clause. $options array contain additional options such as sorting. mongodb driver’s Query method is used to construct a query and accepts filter and options parameters. executeQuery method is used to execute a query. Database collection name and a query object is passed to this function and on success a mongodb driver returns a cursor or an exception is thrown otherwise. To display all the records to user a table is created with table cell headers #, product name, price, category and action. Using foreach loop all records are displayed from $cursor array. With product name, price and category, Edit and Delete links are also displayed. Edit link is assigned a class .editclass. This class is used to fire a click event and sends an AJAX request to server when any edit link is clicked. A data-id attribute is added inside edit link and _id value is assigned o it. Delete link redirects a user to record_delete.php page. A confirmation message is added that confirms record deletion from user. To add new documents into a mongodb collection first a form is created inside index.php. Then product_name, category and price fields are defined. A hidden field id is also added. In case of update of a record it contains id of existing record. Form data is posted to record_add.php page. Create a php page record_add.php. 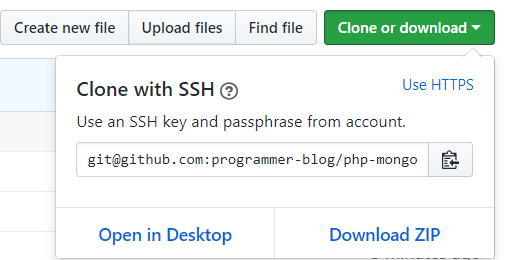 This page includes config.php page to access to mongodb driver manager object to make a connection to mongodb and insert a document to collection. Inside if condition we get product_name, price and category from $_POST super global array. If any of values not entered error code 5 is sent back to user. Write operations are added to MongoDB\Driver\BulkWrite and are sent to the server. After adding insert, update or delete operations to bulkwrite operations can be executed. MongoDB\Driver\WriteConcern is used for describing level of acknowledgement requested from MongoDB. Write operations are executed by executeBulkWrite. It accepts collection name, bulkwrite object and writeconcern. To update a record user clicks on Edit link an AJAX GET request is sent to server and server responds with data of clicked document. To send an AJAX request in JADE template engine you can use code below. First jQuery library is included from jQuery CDN and then inside jQuery ready function an event for the edit links class .editlink is created. Whenever an edit link is clicked this event is executed. $(this).data(‘id’) .val() gets the _id value from data-id attribute of currently clicked link. Using jQuery’s $.ajax method a request is sent to fetchdata.php. 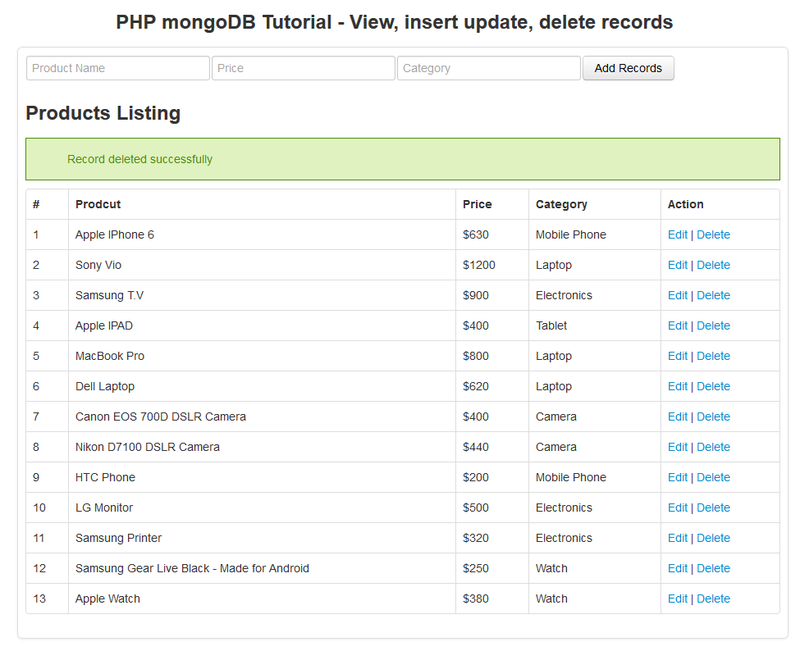 fetchdata.php page responses with data from mongodb server and value of _id, product_name, price and category is assigned to respective fields in the form. Value of Add Record button is changed to ‘Edit Records’ and action attribute of form is changed to record_edit.php. Now when user clicks on Edit Records button, data is posted to record_edit.php. Create a page fetchdata.php and add following code to get data from database server. After id parameter is received a filter is created and is converted to mongodb object id. A query is created by passing $filter and $options array. Collection name and $query is passed to executeQuery method and it returns mongodb cursor that contains the records. Next, from cursor data is assigned to array. After encoding data to JSON it is sent back to client side. Now create a page record_edit.php and add code below into it. User modifies data in the form and clicks ‘Update Records‘ button, server receives request and data is assigned to variables from $_POST array. If user enters all the data correctly then inside else clause a mongodb driver bulkwrite object is created and update command is added to it. bulkwrite object’s update method accepts id and edited data. Here multi =>false means that we are only updating one record. To update all documents that match certain criteria multi parameter is set to true. Upsert parameter if set to true creates a new document if criteria are not met. In this case, it is set to false, so it does not create a new document. writeconcern object is created next. After write concern executeBulkWrite function executes update query. Collection name, bulkwrite object and write concern parameters are passed. Result’s getModifiedCount method contains the number of rows affected. On successful execution, user is redirected to index.php page with appropriate flag. When a user clicks on Delete link of a record. a confirmation message is displayed. If ok button is clicked, user is redirected to delete record page. Create a page record_delete.php and add following code into it. record_delete.php page gets id from URL query string and creates a bulkWrite object. Next a delete operation is added to bulkwrite object where id of record is passed and limit is set to 1. After creating writeconcern object, executeBulkWrite method runs query and takes collection name, bulkwrite object and writeconcern parameters. After record is deleted user is redirected to index.php page. 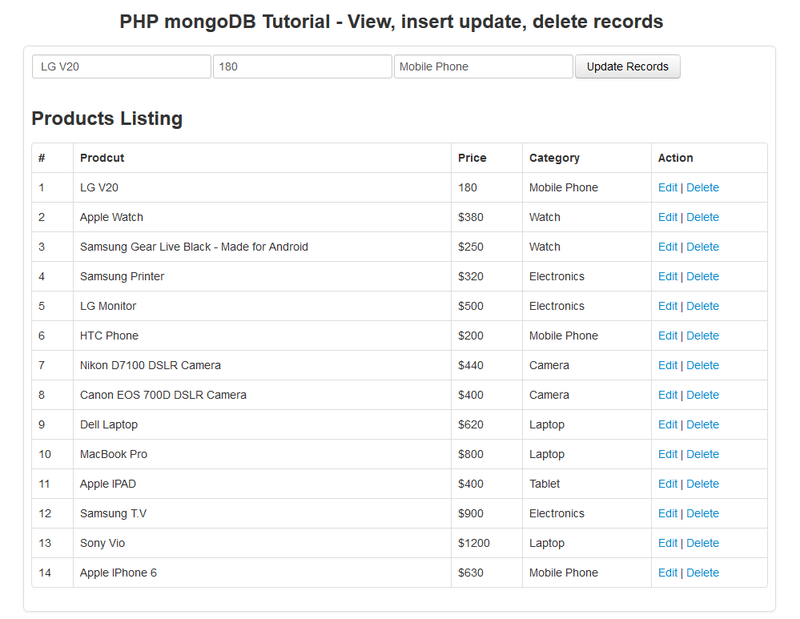 php mongodb tutorial GitHub repository. Follow us on Twitter to keep updated on latest tutorials and articles.